The Christian Wife Life: giveaway WINNER and internet laundry. It's about time I announce the winner of the giveaway. I'm sorry it's taken me so long! Congratulations to the lovely Alex Miller for winning the Bird Giveaway! She is a loyal reader, a sweetheart, and a beautiful bride-to-be. :) So glad she'll be able to enjoy the cute birdie products! Okay so you know how when a room, your kitchen, laundry, or something gets really piled up? And you know you need to do it or clean it but it just seems overwhelming and you know that you're going to have to spend a lot of time on it? Well maybe that never happens to you because you have everything perfectly organized and scheduled and you get things done when they should be done, which is awesome. But for those of you who do know what I mean when I describe that, that is exactly how I feel about the internet right now. Its presence looms over me throughout the day. I know I should attend to it. But I haven't. I've ignored it. When I do get on the computer during the day, it's for work. And I don't let myself get on other websites because that would mean I'd accidentally read blogs for an hour or look on Pinterest for half an hour. Not good. So I have to stay focused. I do get on Facebook, Twitter, Pinterest, email, and such - but it's on my phone. So I'm not likely to type out a lengthy response or truly read everything that's sent to me on my phone. Unless it's for work. Unfortunately, I have gotten SO BEHIND with blogging, emailing, and every other social aspect of the internet. So even though those are usually things that I love, it's piled up into a giant load of internet laundry. Lately when I think about how I should blog/go through my Facebook messages/go through emails, I dread it because I know it's so much to catch up on. I think I should set apart a chunk of time each day and as Nike says, just do it. 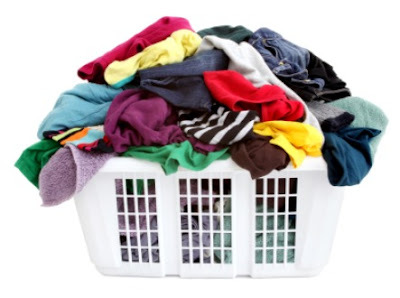 It's like I've been waiting for a day that I can devote to my internet laundry...which is never gonna happen. Do you let emails sit there for a month sometimes before you respond? Do you have a ton of unread Facebook messages? How's your internet laundry? Tips? Advice? I'm sorry if you're one of the people I've neglected. :( It's not that I don't love you. I promise. I am so excited! Thanks Ashley! And like I said in my message.. I absolutely love your blog! Sometimes I feel like I am totally stalking you cause I have never really "known" you but I just love reading about you and think you are super sweet. (That was a serious run-on sentence) Anyway.. YAY. Thank ya ma'am! You are not the only one :) I feel sooo overwhelmed sometimes with all the "internet laundry" I let pile up sometimes. I just try to handle it as it comes and not let it pile up. Of course, it still happens, but a lot less frequently. Yes!! Yes!! Yes!! Trust me - so normal. I know how it goes. I used to hate to come home and sit on the computer since I was on it all day at work. totally understand! Yes! When I had regular comments through Blogger I would get so behind! I eventually installed Disqus and it has really helped me to stay caught up. I can reply right back to a readers comment from my phone or online and it emails it to them. It's helped me to stay caught up! I'm with E (above)...OCD to the max! I HAVE to clear out my inbox...even if it means putting them in folders. Blah...I know, I am over the top crazy! Yes! Last week was the worst! I was so busy! I looked at my blog and realized I hadn't posted in a week! Plust I was late on posting my guest series! You're not alone! Speaking of guest series! I would love for you to particpate! Loving your blog :) Happy I found it!